Thank you. Thank you beyond measure for the response to our sad news last week. We have been wrapped in such warmth and encouragement. I’m currently waiting to determine the next steps for miscarriage, which has been taxing and feels a bit like emotional limbo, but the stories that have been shared with me have made each day so much easier. Thank you. And now it’s time to go back to our regularly scheduled programming. It isn’t a big secret that I’m an avid (read: nerdy) meal planner for our family. I plan about four dinners a week for us, and we create combinations of leftovers for the remaining three, and we eat out roughly every other week… this week was some very necessary Thai takeout. I guess my emotions taste like pork pad Thai level 4 spicy, and I will never complain about that. Introducing Nora Beth to solids was a surprisingly emotional milestone for me (our next emotionally challenging milestone has been her 4 top teeth making their way into her mouth… she is suddenly a teenager). But, as every mother assured me, each new milestone becomes a new favorite, and we’ve had a blast introducing her to more and more foods. 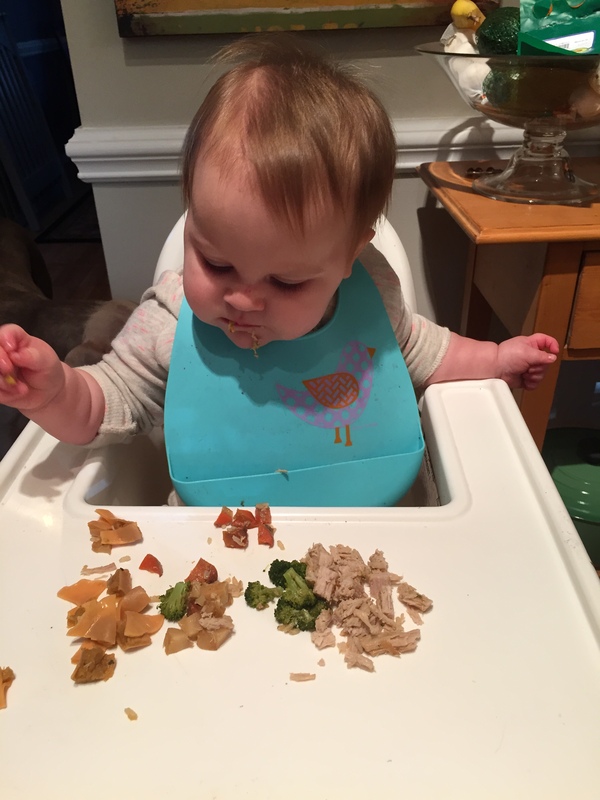 We introduced solids when she was 5 months old, and now, at 10 months, she’s eating 3 meals a day (and nursing 4 times) and pretty much eats anything we eat. We waited to introduce egg until she was 8 months old and followed with yogurt, cheese and meat at 9 months. Lunch – frozen peas (girlfriend loves frozen peas) and an egg salad sandwich (this faux egg salad is my special pride and joy – I mix one smashed hard boiled egg with a spoonful of full fat Greek yogurt, salt, pepper and smoked paprika and sandwich between two slices of whole wheat bread. A huge winner in these parts), sauteed apple chunks seasoned with cinnamon, nutmeg and cloves. 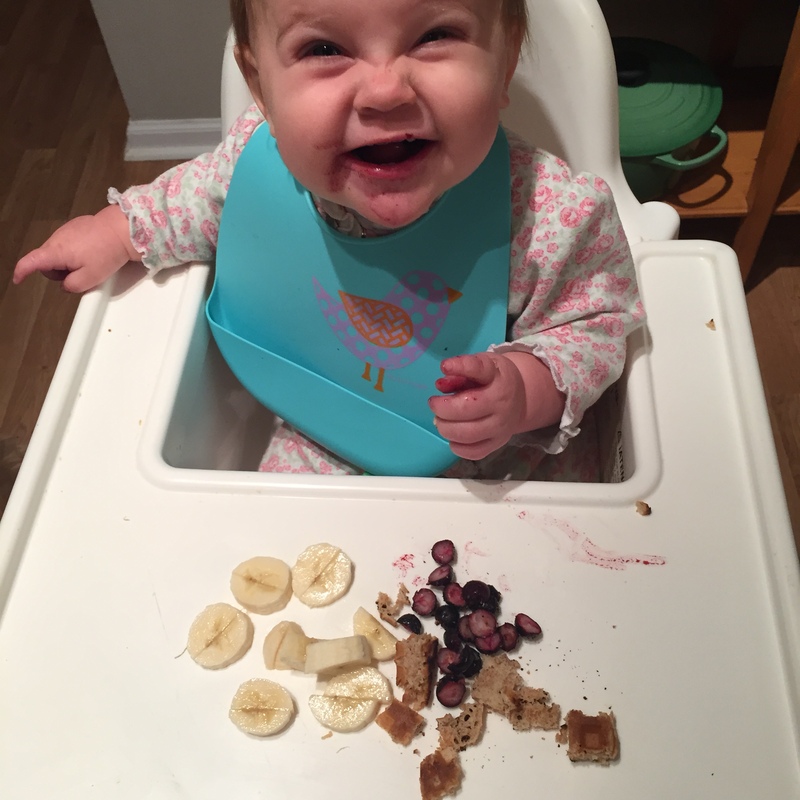 As you can see above, we just put all the food right on her highchair tray. She is very intentional about what pieces to pick out to eat and will move several around until she finds the one she wants. When it comes to the hummus, yogurt, etc, I’ll load a spoon, hand it to her and let her paint herself – I mean feed herself. Otherwise, well, she’s really perfected her pincer grip. 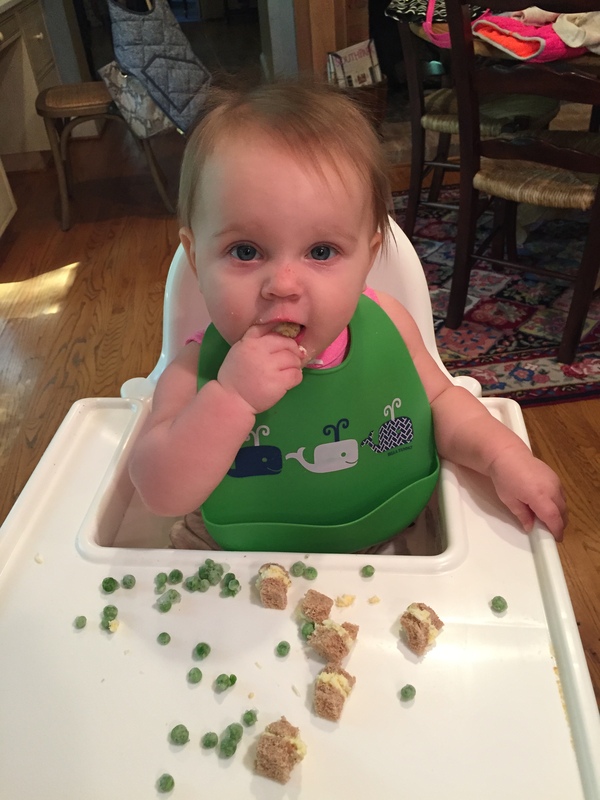 And while we aren’t using plates or bowls yet, we are crazy about these Bella Tunno Wonder Bib and don’t leave home without them!